I always like what we call "performative weeks" on Dear Data, the ones where we purposely execute acts we wouldn’t have done if it wasn't for the project. I like them because they help me step out of my routinely comfort zone in ways I am not able to do instead. On week 43 we challenged ourselves to truly go off the path of the ordinary: we would try to do as many new things as possible, activities we would never do on a regular basis. As I person, I am ambivalent about my relationship with my habits, I actually experience a paradoxical status. From one hand I absolutely am a routine person: I like to have my days precisely planned, I find myself happy when I am in control of what’s happening, I have my schedule and I stick to it always. I don’t normally even like to try new foods. I always say that my routine supports my discipline, helps me to stay committed to what I do, and to do it well. But from the other hand I am incredibly eager to try new things: precisely, only the kind of things I actively choose to embrace. I love to grow, to take in bigger challenges, to be creatively inspired by new worlds. I am not sure if I make any sense to anybody other than me here, but my sense of what’s going on is my habits and strict routine help me being free for and open to bigger changes, the ones that I need to grow. Of course what I’ve just touched upon describes me as a human being, in the general sense and in the long term. But I had fun to challenge myself with tiny new things for a week. - if it happened more than once in the week. This is one of that weeks where I want to share with Stefanie what my exact logs are (since I would love to know more about hers!). What a boring person am I ? 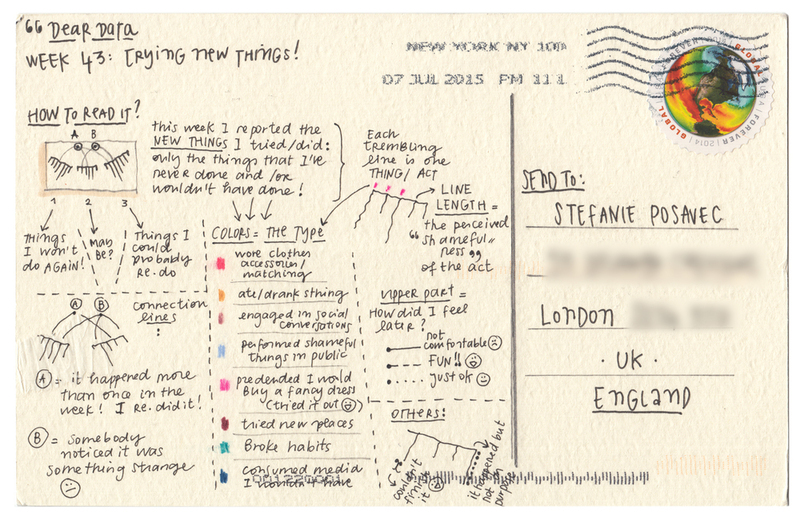 Stefanie interpreted this week in a radical way: she also tried some new techniques for her postcard! Actually, as much as I had fun trying out new things for seven days, I am not sure if this is one of those weeks that will stick with me. In fact, I easily envision myself completely forgetting of this week, and taking the easy way of my ordinary days. Ouch! I found this week’s performative tracking difficult, as it keenly highlighted how much of a creature of habit I am, whereas I used to think that I was relatively adventurous. Or, maybe I still am, but needing to gather data on this activity made it less spontaneous? Trying to incorporate ‘newness’ into a daily routine is difficult sometimes: I could push work aside and sit in the park, or start drinking alcohol at 8am, and yes, that would be new but not necessarily an improvement on my life. So, in the end, my moments of trying new things were really quite small, and were mainly ways for me to break my routine. I don't think I really like the performative weeks; while I start them with the best of intentions (I do, Giorgia, I always do!) by the end of the week they make me grumble and feel like a petulant teenager. 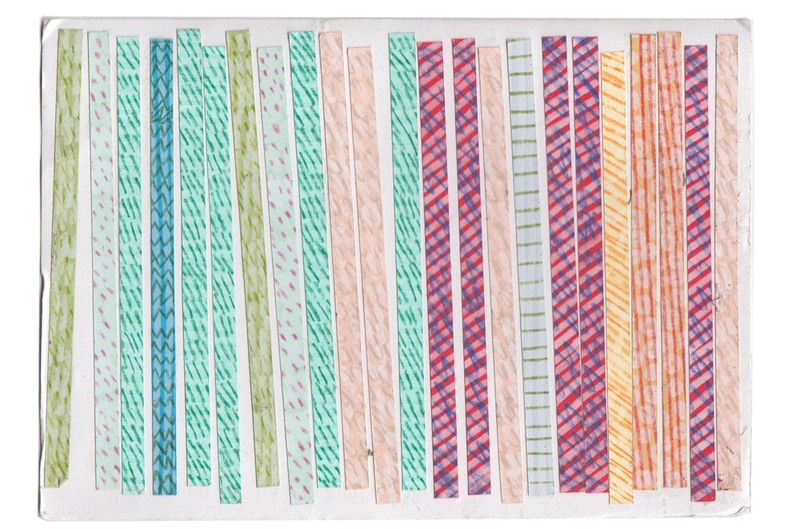 Or maybe this just wasn’t the best week in general, as I’ve been starting to feel the effects of a year-long project: I seem to have a sort of drawing paralysis, where I find it incredibly difficult to pick up a pen or pencil and draw my card. The consequence of this paralysis means that I mail my postcards later and later each week all the while fretting about this and forcing myself to make the first mark on paper. We are at week 43 (!) and sometimes it feels this sort of project can take a mental toll, and when I am very busy it often feels as though Dear Data is wrapping itself around my life, through my thoughts, and infiltrating into every interaction with everyone around me. I’ve often discussed this idea of how data-gathering can become an endurance test, a feat of physical and mental pain one puts oneself through in order to get to a higher level of achievement. So, I guess that this 'pain' that I'm going though is a good thing, even if it doesn’t feel like it. Anyhow, I gathered my paltry ‘new’ data from this week and thought that I would also try something (sort of) new on my postcard to hopefully deflect from how boring and cautious I was. So, I decided to work with new pens and explore a different method of drawing and collage than I’ve done before. This postcard was laborious to create, but by the end I felt proud of the results and popped the card in the post to Giorgia. But of course, the postal service only ruins the cards you care most about and my postcard arrived at Giorgia's completely mangled and torn. The glue I used in my collage wasn't strong enough and some of the paper strips were ripped off the card...apparently some of my data fell off and is likely lying somewhere in a postal depot. 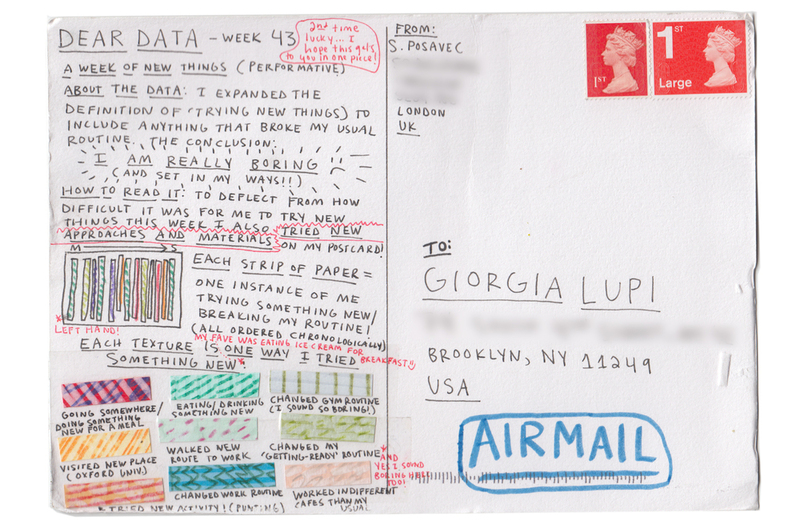 I was so distraught that I quickly got in touch with Giorgia, asking if I could resend the card since some of the data was missing. Giorgia approved, so I sent another postcard, using a stronger glue than before, and luckily the card survived with all of its data intact. I like Giorgia’s drawing this week, she has a skill of using barely any pen lines to communicate such a rich amount of information. I think she had more fun than me this week, particularly when she was trying on fancy dresses, but I like how her lines ‘trembled’: it’s funny how I feel afraid and alone on the performative weeks, but when I finally receive Giorgia’s card I realise we both felt the same way!